BetterWorldians Radio today announced that John McConnell, founder and President of Cristo Rey Philadelphia, is a featured guest on the online show and podcast (BetterWorldiansRadio.com). BetterWorldians Radio inspires listeners with the people and ideas that are making the world a better place. McConnell told listeners how his own excellent education inspired him to find a way to offer the same opportunity to young people in need in Philadelphia. Cristo Rey is a network of 32 college preparatory high schools, serving more than 10,000 students across the United States. Students take part in a rigorous academic program, as well as a Corporate Work Study Program, that provides students with real world work experiences and funds the majority of their education. At Cristo Rey Philadelphia, 100% of students were accepted into a four year college. McConnell expressed gratitude for the hard work of many individuals and organizations that serve Cristo Rey students. “Cristo Rey is a pretty extensive collaboration of a lot of different entities in Philadelphia, all for the purpose of doing good for these kids,” said McConnell. BetterWorldians Radio is co-hosted by the family team that created the popular social game on Facebook called A Better World. It rewards players for doing good deeds while helping to raise money and awareness for charities. Co-host Ray Hansell announced that Cristo Rey Philadelphia is the Charity Partner of the Month in A Better World for the month of September. When players complete 250,000 good deeds in the game, the Hansell family will release funds to provide transportation to work study programs for Cristo Rey Philadelphia students. “We’re thrilled to partner with Cristo Rey Philadelphia to help give students in need a chance at a brighter future. Cristo Rey is offering a glimpse of a better world for students who otherwise wouldn’t see it,” said Hansell. Listen to the episode featuring John McConnell and more at BetterWorldiansRadio.com. BetterWorldians Radio is an online show and podcast available at BetterWorldians.com. BetterWorldians Radio is brought to you by the 501(c)(3) BetterWorldians Foundation and is co-hosted by the family team that created the popular social game on Facebook called A Better World. BetterWorldians Radio is produced in Wayne, PA.
A Better World is a social game on Facebook that encourages doing good deeds while helping to raise money and awareness for charities. Over 40 million good deeds have been done in A Better World by more than 4 million people in over 100 countries. Find out more at ABetterWorld.com. 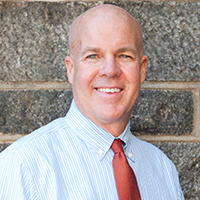 Mr. McConnell is the head of the school’s leadership team and represents Cristo Rey to the Philadelphia community. He retired as a partner at the management consulting firm Deloitte in order to lead the founding of Cristo Rey Philadelphia High School. Mr. McConnell is a graduate of Georgetown University and earned a Masters in Business Administration degree from the University of Pennsylvania’s Wharton School. As the largest network of high schools in the United States whose enrollment is limited to low-income youth, the Cristo Rey Network delivers a distinctive approach to inner-city education that equips students with the knowledge, character, and skills to transform their lives. From freshman year, Cristo Rey schools establish a culture of high-expectations by blending rigorous academics, four years of professional work experience, Catholic moral values, and support for students to and through college. Cristo Rey Philadelphia opened in 2012.